I recently woke up thinking about a recipe I used to make when I first started to experiment in the kitchen. It came from a cookbook that my mother had gotten sometime in the early 80s from Cooking Light magazine. Along with the usual "light" recipes, the book had an entire chapter on microwave cookery. Though I was still too young to mess around with the stove, my mom let me go to town with the microwave (once I understood that metal things were off limits, that is). There was an easy lemon pudding cake that quickly became my favorite. It was a kind of souffle that relied on stiff egg whites for height and just the teensiest bit of flour. I made the pudding cakes all the time that year until I was able to graduate to box mixes and the oven. I don't think I thought about those little lemon cakes again until the other day when they reappeared for no reason at all. I called my mom and she promised to look for the book. We stopped by the house for dinner a couple weeks ago, and found the book sitting on the kitchen shelf. I excitedly flipped through the pages right to the recipe for lemon pudding cakes. There was the picture I'd remembered, and the page...well it was filthy! Crusts of long ago flour and sugar and a rip where the paper had glued itself together. It was the only page in the book that looked like that; the surest evidence of a favorite recipe. We all have books like this, sticky and splattered with frosting from that cake we made grandpa on his 75th birthday or the splatter of cranberry sauce from the first time mom let you help with Thanksgiving. Seeing that messy and beloved page made me wonder about the stories in other people's cookbook pages, and so Sticky Books, a new weekly interview column here on Always Order Dessert, was born. Each Friday, a different food blogger or will share his or her top three favorite cookbooks with my readers. 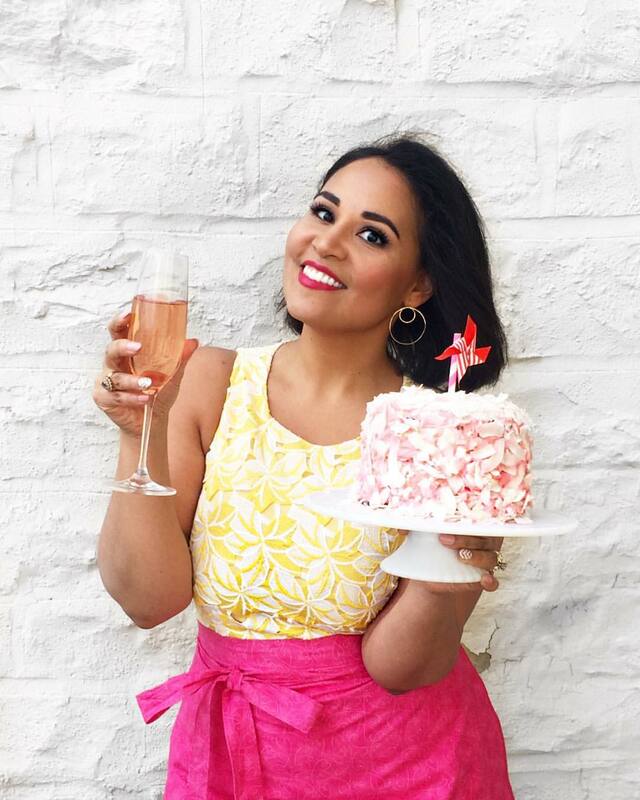 Sticky books are a badge of honor for the home cook, sometimes even more memorable than the album full of snapshots, and so I'm excited that so many incredible bloggers have been willing to share them with us. If you have experiences with the books that these bloggers mention, I invite you to leave them in the comments, and please don't hesitate to tell us about your own sticky books. 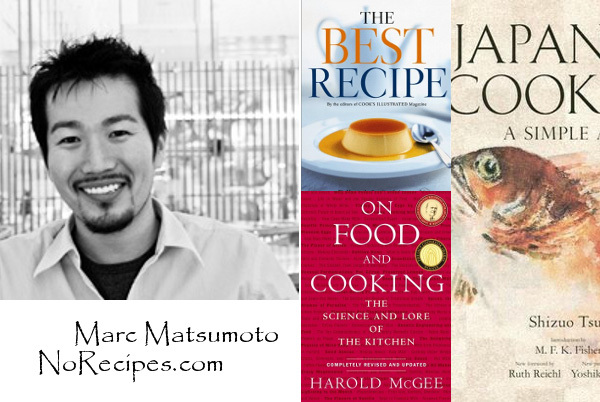 Marc Matsumoto started his food blog No Recipes nearly two years ago. Based on the philosophy that cooking is 50% technique, 40% inspiration, and 10% ingredients, he strongly believes that armed with a handful of basic techniques and a little inspiration, anyone can make a tasty meal from even the most derelict pantry. When I sent Marc the questions for this feature, he told me about a new event that he just launched on his blog called Blog Away Hunger, which is meant to raise money for the World Food Program. The WFP gets food aid to the people that need it most, and with one in seven people on Earth suffering from chronic hunger, they need all the support they can get. He's inviting everybody to participate in this event by simply creating a meal that costs less than what you'd normally spend, post about it on your own blog or website, and then donate the money you saved to the WFP. You can check out Marc's blog for more details. Marc: Since I don't cook with recipes, my most used cookbooks tend to be reference books where I can quickly look up information on ingredients and basic techniques. This is my "stickiest" cookbook. It doesn't contain any recipes, but it holds within its blessed binding, answers to nearly any food related question you may have. Like "How is soy sauce made?" or "What do cell walls have to do with the mealiness or meltingness of fruit?". This is the Webster's of the culinary world. What I love about the folks at Cooks Illustrated is that they take scientific rigor and apply it to food. Through a documented process and iterative testing, they figure out the best way to do something. As with anything that comes out of a lab, their recipes tend to lack soul, but what it lacks in character is more than compensated for with rock solid techniques and play-by-play details. You won't find any drool-worthy photos or nostalgic stories here, but if you want a reference book on Japanese ingredients and cooking, this is the only English language book that will meet your needs. Like Julia Child, with her tome: Mastering the Art of French Cooking, Tsuji opens the door into the mystical world of Japanese food with her book. 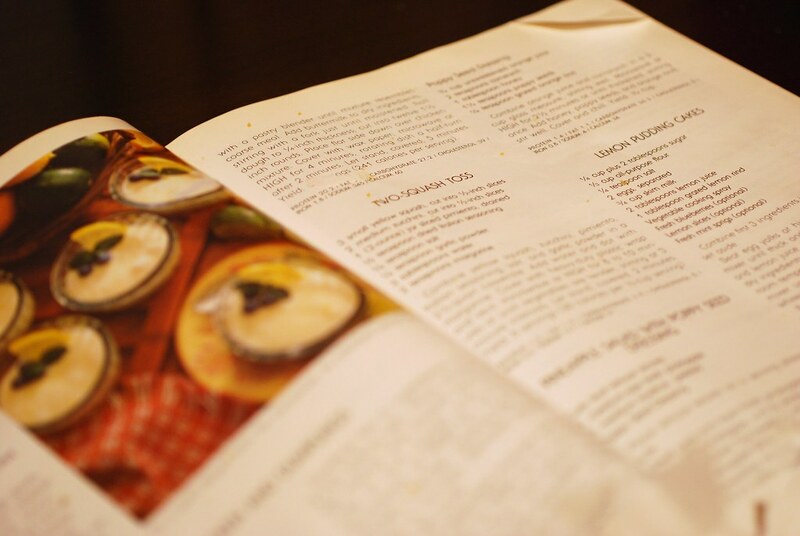 Have you cooked with any of Marc's favorite cookbooks? Tell us about them in the comments! And remember to check back next Friday for the next edition of Sticky Books. Great list! I love the CI books! What a great blog you have here, Ms Ramos. My cooking bible, and one that was given to my grandmother by her godson a few years before she passed away. The stickiest pages are those for the Vegan Chocolate Cake (very simple recipe, great results and egg-, dairy- and nut-free for the allergy children in my life), Macaroni Cheese and (my favourite) Open Faced Peach and Custard Tart. Which I happen to be baking as I type. I always show lots of cleavage when cooking recipes from this book. The stickiest pages: Chocolate Brownies (I add coconut and glace cherries to mine... divine! ), Fairy cakes (best cupcake recipe I've ever found) and the Caramelised Onion Tart. Straight of the 80s - food sure looked different then. Often like someone had just vomited straight onto the plate. Or worse. This book is a nostalgic favourite. My stepmother had this book and often cooked from it for dinner parties. It was my first foray into the world of food for pleasure and not just sustenance. Favourite page: "Cappuccino" -the recipe involves boiling black coffee and creme in a pan and then chucking half of it in the blender for 30 seconds. "True cappuccino needs an expensive machine to make it correctly: this simple method gives a very similar result." Priceless. I really need to get a copy of On Food & Cooking. It was specifically recommended at school and is credited often in our "textbook." Harold McGee is pretty awesome. 1 and 2 are my absolute go-to guides on anything. Best Recipe is an experimental person's dream because if you read the story behind the recipe you understand WHY it's done that way, and how to change it just so to be perfect for you, or adapt to different ingredients. And McGee makes being a food dork easier than ever before. What a great idea! Marc's picks are three that I don't have. Can't wait to check back and read these posts each week. I am loving your sticky book posts. So creative!! After reading this post I went through my cookbooks and I laughed because I had never noticed how sticky they were. So, I thought I would share my top 3 sticky books. This was the first cookbook my husband gave me when we were first married. At the time I was just learning how to cook a meal every night for the two of us and I found this book invaluable. The slow-roasted chicken recipe is still the best I've ever had, and the pages are completely wrinkled and stained. His pizza dough recipe is my old faithful friend...even though I look for better, more hip dough recipes out there, this is the one I always return to. I will admit, I have all of her books, but this one tops them all. The flavors are out of this world and there is also such a simplicity to her recipes. I love the chapter entitled "Entertaining for Kids". I especially love making the whipped hot chocolate with homemade marshmallows and greeting the kids with big mugs of it when they come home from school in the winter. I can't tell you how many potlucks I've brought the "Pasta with Sun-Dried Tomatoes" dish to. Everyone always asks for the recipe and I will admit, I wish I'd come up with it (no offense Ina). About 7 years ago, after deciding I was only going to cook with organic ingredients, a friend recommended this book. I'll admit, I was a bit scared of the it at first (because of its length), but I find myself referring to it on a daily basis. Not only are there fantastic recipes, but the information is invaluable. The empanadas from this book are perfect: buttery flaky pockets filled with deliciously seasoned vegetables, beef and rice. Her almond cookies are completely addictive as is her nut butter recipe. This book is getting so sticky that the other day I thought, "Wow, I'm going to have to buy a replacement for this book in a couple of years." Now, you can't say that about every cookbook.